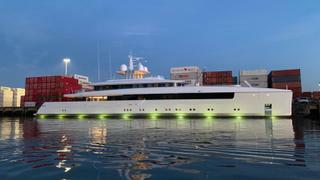 The 58 metre Vitruvius Yacht designed Feadship superyacht Najiba been delivered to her owner. Najiba, meaning "noble", departed the Netherlands-based yard at the weekend for her maiden voyage to Bergen in Norway. It comes after the yacht was launched on January 3 at a ceremony attended by the owner's project manager Peter Wilson of MCM, along with interior designer Guillaume Rolland of Studio Christian Liaigre and Feadship's naval architects. The all-aluminium superyacht features low-profile exterior styling created by Vitruvius Yachts while naval architecture comes courtesy of Philippe Briand and De Voogt. The design was the result of three years of collaboration between the designer, led by Philippe Briand, and the "highly experienced" owners, who have owned two yachts previously. Vitruvius revealed the owners were attracted to the design team for its approach of "architecture and design" inspired by Leonardo Da Vinci's sketch, the Vitruvian Man, which illustrates how Da Vinci understood the proportions of the human body. 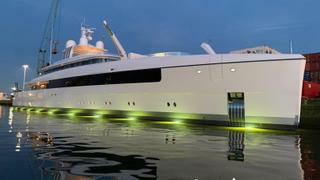 Consequently, the design house focused on producing a yacht that featured "well-balanced architecture and clean design". Najiba, the fifth yacht designed by Vitruvius, "has been designed for efficiency and to deliberately express purity through minimalist, striking lines." "The brief was to create an environment that would be comfortable for the family, both at sea and when moored." 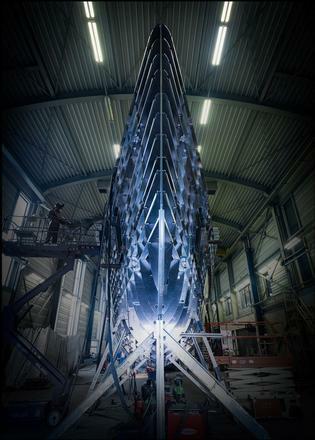 The design firm pointed to an "extremely efficient" hull design by Philippe Briand which "reflects the true DNA of Vitruvius Yachts." Vital statistics include a 10.95 metre beam and a 2.6 metre draught, a cruising speed of 12 knots and a top speed of 16 knots. The interior by Studio Liaigre features wood contrasted with "immaculate white surfaces", resulting in a style that "transports the guest to a whitewashed beachside villa." Speaking at the launch, project manager Wilson said the yard had managed to "bridge the gap between dream and reality." 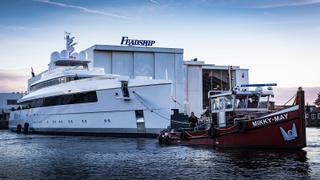 Addressing Feadship's assembled workforce on January 3, Wilson said: "Najiba is a truly remarkable superyacht and the family are thrilled with what you have created for them." 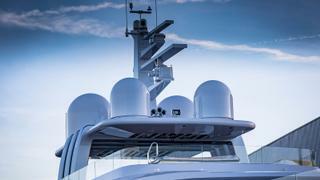 Wilson added: "They had seen Feadship quality in other yachts, hence the longheld dream to develop one of their own. Even so, the owners and their extended family could not believe their eyes when the final result was revealed to them this morning." Designer Philippe Briand previously described the yacht "as a Mediterranean boat with plenty of accommodation and a nice aesthetic."